One of the first lessons that new pet parents learn once they begin researching proper pet care is this: not all of the foods that humans consider to be healthy and safe are suitable for animal consumption. Though this is crucial knowledge to have regardless of the species of your pet, it is even more important for tiny animals like hamsters, rats, and rabbits—because of their small size, exposure to even a tiny amount of a toxic substance can mean serious complications and even death. So, as hamster parents, we are especially wary of the foods that we know are not very good for our pets. Some foods—like chocolate, sugar, and alcohol—are pretty obvious; after all, they aren’t exactly healthy foods even for us humans! But danger foods are not always obvious, and your intuition is not always a good guide. Some of the foods that are the most dangerous for our pets are the same ones that our doctors practically beg us to eat regularly! One of the most notorious pet poisons is the humble, unassuming grape. We know that this juicy fruit is toxic for cats and dogs, but what about our hamsters? Can you give your hamster grapes? The answer is a surprising yes! 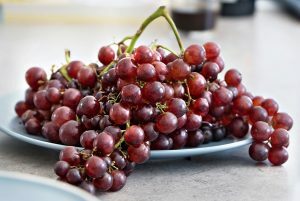 Even though giving your cat or dog a handful of grapes can cause serious health problems, these fruits are actually a sweet, healthy treat for your adult hamster. Fortunately, the chemicals in grapes that are dangerous for cats and dogs appear to be perfectly safe for hamsters; this means that, even if your hamster ends up eating one grape too many, they probably won’t suffer from any serious or long-term health problems. Giving your hamster a piece of a grape for dessert is a safe, healthy way to satisfy their sweet tooth. Just don’t overdo it—giving your furry friend too much fresh fruit can cause digestive problems in the short term and weight gain, which can lead to obesity, in the long term. Most hamsters should not even eat one whole grape in a sitting. It is also wise to keep in mind that certain hamsters have fragile digestion and may not be able to stomach grapes easily. If your pet shows signs of upset stomach or abdominal pain after their first taste of grape, opt for a different type of treat. Because hamsters are mostly herbivorous (the only animal food that your pet would eat in the wild would be the occasional insect), they are well-suited to digesting plant foods, including moderate amounts of fresh fruits like grapes. Even though fresh grapes probably should not make up a large part of your hamster’s meals, there are several health benefits to including them in their diet—especially if you choose to use fresh grapes instead of highly processed, corn-based hamster treats. Humans have been eating grapes for their health benefits for centuries, and for good reason. These small, sweet fruits are fairly low in calories and free of saturated fat and cholesterol, which are two major dietary risk factors for heart disease. They also contain both fiber and water, which can hydrate the body and support optimal digestion. This watery fruit can be an excellent option for hamsters who are prone to the occasional case of mild constipation. Dietary fiber, which is present in most plant foods, supports digestion by absorbing water and carrying it into the intestines, where it can soften and lubricate hard or impacted stool. The fiber in grapes can also speed up digestion by adding bulk to stool, which stimulates the intestinal tract. This is why giving your hamster grapes in moderation can help combat constipation. 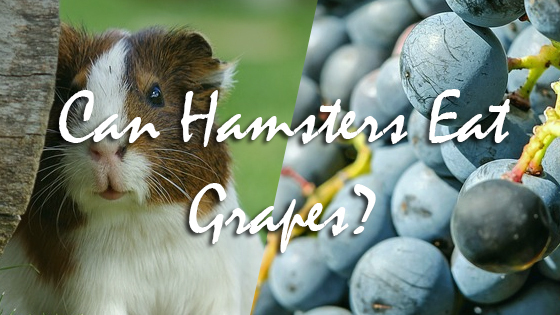 Of course, grapes are more than just prune juice for hamsters! These little round fruits are full of vitamins, minerals, and antioxidants that can support your pet’s long term health. Grapes of all colors (red, green, and black) are rich sources of Vitamin C, thiamin, Vitamin K, potassium, copper, and manganese. They also contain smaller amounts of Vitamin A, Vitamin E, B vitamins, iron, magnesium, zinc, and calcium. Vitamin C is a crucial vitamin for hamsters and humans alike—it is used for immunity and healing. If your pet does not get enough of this vital vitamin, they may develop scurvy, which causes extreme fatigue, hair loss, anorexia, squeaking in response to touch, and walking clumsily or hunched over. Though most of your pet’s Vitamin C should come from their hamster seed mix, adding in small amounts of fresh fruits and vegetables can help boost their intake, which may help shore up their immune system against infection. By making sure your pet eats enough Vitamin C, you may be able to reduce their risk of illness. Grapes are chock full of a wide range of antioxidants, including a polyphenol called resveratrol. Antioxidants like resveratrol protect your hamster’s health by destroying dangerous, highly charged particles known as free radicals, which cause cell damage that results in disease. Including antioxidants in your hamster’s diet may be able to reduce their risk of many diseases that have been associated with free radical activity, including heart disease, type two diabetes, and several forms of cancer. Grapes are great, but not when they are consumed in excess. Giving your hamster too many grapes in one sitting will almost certainly result in stomach pain and diarrhea, which can lead to dangerous complications if left unaddressed. In the long term, too many grapes can cause weight gain, which may lead to obesity. Obesity increases your hamster’s chances of many painful, chronic, or life-threatening diseases, so it is crucial that you keep your pet’s caloric intake in check. Lastly, grapes are not an ideal food for all hamsters—some individuals may have a hard time digesting the chemicals found in fresh grapes. If your pet shows signs of discomfort after eating a piece of grape, try giving them a piece of carrot or apple instead. In conclusion, grapes are safe, healthy treats for most adult hamsters when they are given in moderation. They are rich in vitamins, minerals, and powerful, disease-fighting antioxidants that can help keep your pet happy and healthy in the long term. The one thing to keep in mind is portion control—because hamsters are so small, most of them should only eat around half of one grape every day. Can Hamsters Eat Grass? Can Hamsters Eat Fruit?